Skyscraper with Dwayne Johnson, then in the US armed forces, begins with his character losing a leg to a rogue bomb (as if a bomb would have any chance against The Rock). That will figure later on in the story. We flash forward to find our hero helping Mrs The Rock (Neve Campbell) fix a problem with her smartphone. “You turn it off and then on again,” he O’Dowds. She makes him do it for her. The scene goes on. Why is this happening? It’s almost as if the film is gesturing towards some later plot development. 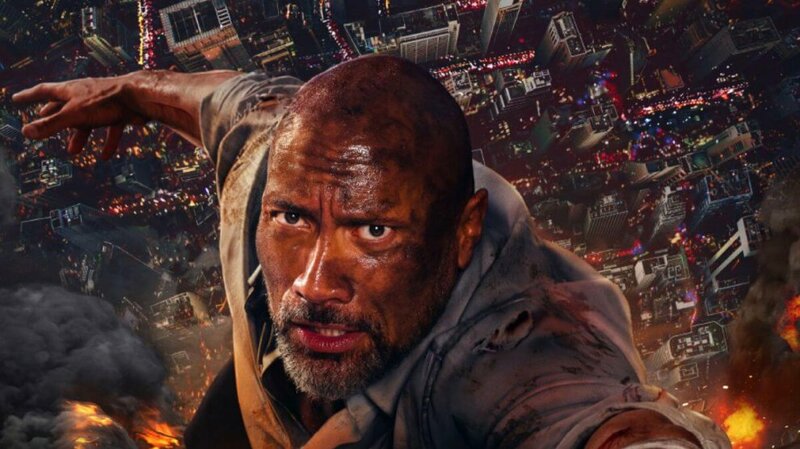 Then Dwayne, now a security consultant, goes to work in a newly opened Hong Kong skyscraper (it’s a mere coincidence that the film is set there and that the star is huge in Asia) to be shown around the huge sphere at its apex. “It’s the eighth wonder of the world,” his boss says as a multitude of oblongs rise from the floor to project images of the two men back at them. This is ludicrous. It’s not as if the film is going to end with a shootout in the style of The Lady from Shanghai or Enter the Dragon. Those screens won’t ape the mirrors in those films. Will they? No spoilers. None of the foreshadowing warns us just how depressingly ordinary Skyscraper turns out to be. I am as well disposed to the average Rock-delivery system as the next fellow, but there are limits to the laziness even his greatest fans will allow. As the opening paragraphs have undoubtedly foreshadowed, Rawson Marshall Thurber’s film is literally a shameless retread of Die Hard. Euro-trash gangsters attack the building. Our hero is the only one who can save the day. We said “literally … shameless” and we meant it: entire shots and individual scenes seem lifted from the 1980s classic. The few innovations don’t much work. The hero moves nimbly for most of the film and then, when a plot hook demands it, suddenly remembers that he has a prosthetic lower leg. A running joke about duct tape is baffling. The CGI is so drably artificial that – impossibly for a film with this plot – almost all sense of jeopardy is lost. Oh well. If we must have bad films, we may as well have bad films with good people. Johnson remains a delight and it’s a pleasure to welcome back the age-appropriate Campbell in something that turns out to be more than a passive wife role. That is foreshadowed when we hear early on that she is a Navy combat medic. I studied film-making and photography in College of Design, Dublin 1, Ireland. I do Film-promo work for the writer and film-producer Steven Cutts, who financed and executive-produced the films 'Will's Diaries' (2010), and 'Adieu Marx' (2013). We have promoted & shown Adieu Marx, at Cannes Film Festival 2013. I wrote the book 'The Geebst', on Kindlebooks, and am presently trying to get it made into a TV cartoon series.